Fleas are one of the most common and irritating parasites that affect dogs. They seem to LIVE to torment our beloved pets, cats and dogs. They love the warm habitat provided by your dog, and survive by biting your dog. Fleas live up to 99 days, and live on your dog’s blood. They lay eggs that drop off your pet and into your carpet, hatch and the cycle continues. It is MUCH easier to prevent fleas than to fix a flea problem. These products can be used to kill fleas, or just to prevent them. Some pet owners feed foods such as garlic and tripe, as they have been said to help prevent fleas. Fleas can cause other problems, such as tapeworm, which can be transmitted to humans, and cause liver damage. If you already have a flea problem, you may also need to treat your home and other pets, including cats. Consult your vet for a recommended household insecticide, and use with caution. TIP: Don't forget to clean your vacuum. Untreated fleas can lead to irritated skin infections, dermatitis, tapeworms, and even anemia (lowered red blood cell count). Flea treatment should be started in the spring, and continued until the fall (or nights of frost). Some areas need flea protection year round. Especially since homes are heated year round, the flea can live in your home year round. Again, consult your local vet for the best advice for your area. Fleas start to multiply and become a problem in the spring because they like the warmer weather. As soon as the weather warms, fleas begin to hatch. Also, spring is a time that your pets begin to go outside more and more, as they go on longer walks and visit parks. Getting rid of fleas can be difficult. Taking steps to prevent fleas can pay off in the long run. To properly treat fleas, you must understand their lifecycle, and how they live. You go on an outing (weekend of camping), and your dog picks up a couple fleas. You come home, and immediately shampoo with flea shampoo, and kill those two fleas, and comb out all the eggs. You will likely be fine. You have been on a weekend outing, and come home and everyone goes in the house, (including your dog)...or he goes to his doghouse unbathed. Fleas feed and mate within 24 hours, and lay eggs in 36 to 48 hours. If you are coming home from camping…those few fleas will have already laid eggs, which will drop into your carpet, IF you allow your dog in your home or they will drop into the dog house, wherever the dog sleeps. FUTURE Fleas HAVE been started. 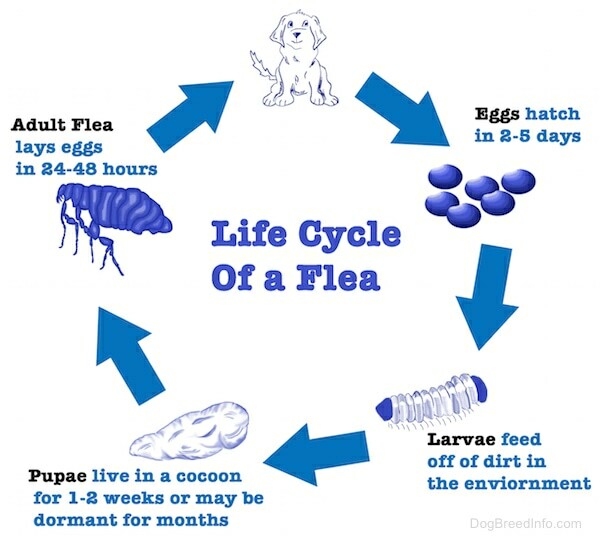 To avoid fleas, you must STOP the cycle. Sometimes just a simple flea bath will do, but not always. This Dog should have been bathed immediately upon returning home, BEFORE he enters the home or doghouse. You went on an outing and came home, and continued as normal, not knowing your dog had picked up two fleas and a week later, you saw your dog scratching. Fleas are already laid, and hatched within ten days. Eggs are already in your carpet ready to hatch and jump back on. Fleas that got knocked off are in the carpet, just waiting to jump back on. If your dog doesn't have a flea control that keeps on working and working, a flea bath will kill the adult fleas ON your dog. All the eggs in the carpet are going to hatch, and jump on your clean dog. All fleas that got knocked off before the bath will jump back on your dog. The fleas and eggs in the doghouse will jump back on. Consider ONE single flea lays about 25 eggs per day. They multiply fast. Another factor that people do not realize, and wonder WHY their flea control isn't working, is that the flea is able to go from eggs to larvae to cocoon (or pupae) living in your carpet or on your dog for months. They have a protective coating that protects them from the environment, surviving for months, only hatching when conditions are favorable.